We understand the complex clinical and business needs of today’s orthopaedic practice. 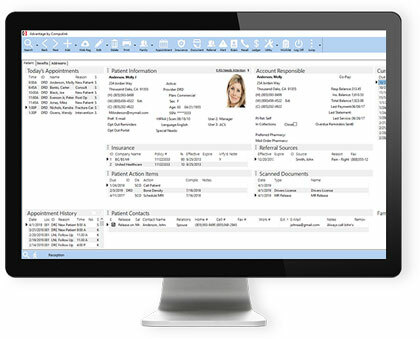 From your front desk, exam rooms, surgical center, and imaging, our all-in-one orthopaedic medical software is specifically designed to increase your practice’s efficiency, profitability, and to give you more time for what matters most—your patients. We offer a single solution through our orthopaedic clinic software for your entire office workflow including EHR, Practice Management, E-Prescribing, ASC, and a patient portal. Designed specifically for Orthopaedics, Advantage is a medical software that guides you with its extensive medical database of diagnoses, histories, tests, treatment plans and surgical procedures. Quickly view, manipulate and interpret all of your patients’ diagnostic images directly from your Advantage software using our DICOM viewer. Advantage also supports integration with your onsite imaging devices (e.g. X-ray) to streamline your clinical workflow. Our responsive, knowledgeable support and training team is by your side every step of the way to ensure your EHR success as you utilize our orthopaedic medical software.